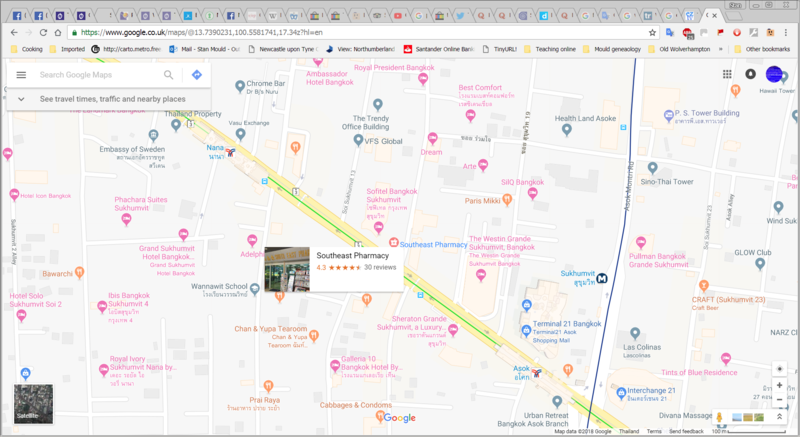 What are the cheapest pharmacies in Sukhumvit to buy Sidegra & Kamagra Jelly? This one is good. Kamagra 4-pack is 300 baht. They also do a 7-pack of gels but I forget how much - about 700 baht I believe. Just 5 minutes from either Asoke of Nana BTS stations. What is Sidegra & Kamagra, please? Kamagra is expensive compared to Thai GPO, which is unlikely to be sold in high rent locations. Seen the Sidegra for 100 THB 4 x 50 mg....never in a fancy mall or address. I would also feel better about traveling with Thai GPO, even if I am just walking in broad daylight through extortionville...err, I mean Thong Lo. Southeast is too expensive. Somewhere else does Sidegra 100mg for 200 baht. I heard 180 baht was the standard recommended retail price written on the pack before but don't know where they sell it for that price or less. Sidegra is a Viagra generic in tablet form made in Thailand (after the patent had expired). Kamagra is a Viagra generic in "jelly" form (sachets) made in India. I heard 180 baht was the standard recommended retail price written on the pack before but don't know where they sell it for that price or less. Don't forget that even in Thailand you would legally need a prescription for this. So don't be surprised about a premium for "over the counter". You mean the small pharmacy between Majestic suites and Soi 4? Kamagra is also available in tablet form. Can you explain just where 'somewhere else' might be located? Charoen Pharmacy, near Sukhumvit 4, next to Bully Pub.